to die in THE ADVENTURES OF HAJJI BABA. To say that this film is a bit, eh, odd is putting it mildly. 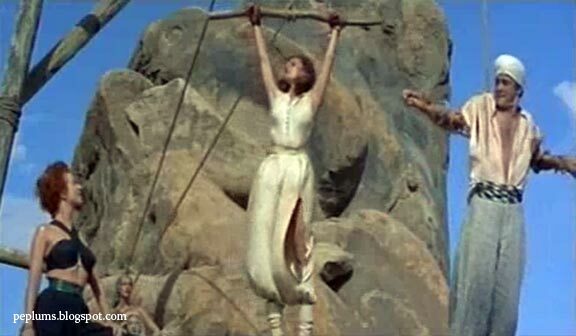 A truly campy Sword & Sandal from 20th Century Fox that goes in every direction. It's entertaining, for all the wrong reasons: the story doesn't make a lick of sense; the Princess, the beautiful Elaine Stewart, is a truly annoying character. I wanted to strangle her. There's a group of desert Amazons (!!!) who are as pale as can be. The leader of the Amazons (Blake) looks like she's just stepped out of a film noir, with blazing curly red hair! Handsome John Derek plays a barber/adventurer. Nat King Cole sings the title song. The whole thing is wacky. Beautiful (but not convincing) location filming though.